Turkey Sightings | Hello Saigon! It’s almost Thanksgiving in the Western world and Westerners that are living in Vietnam are starting to prepare for this holiday. Hence, the high demand for turkey! 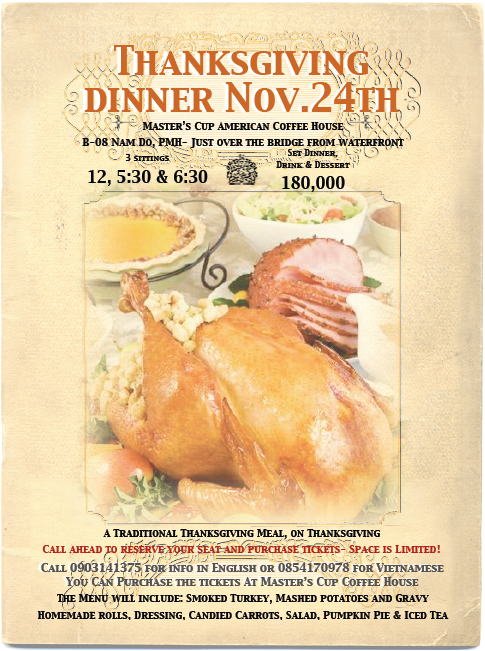 I actually asked hubby if we can attend a Thanksgiving Dinner at the Master’s Cup (see flyer on the left) because their menu sounded yummy — but we’d probably feel like posers. I don’t mind really because I’m just in it for the food. LOL. Just a day away before Thanksgiving and the demand for turkey has skyrocketed and some supermarkets have ran out of stocks. This entry was posted in Event and tagged Thanksgiving. Bookmark the permalink.